Art in the 1800s brought us the terms Neoclassicism, Romanticism, and Realism, covered in my New Slant on Art History. The second half of the century saw a major shift in how artists used art to portray the world around them. Let’s look at “Impressionism,” a made-up stylistic term based on a Monet painting Impression Sunrise. Impressionism is the first more or less revolutionary art movement since antiquity in the West. Instead of the emphasis being on subject matter, style, or the hierarchies of “fine art” espoused by the French Academy, Impressionism was basically a documentation of the artist’s perceptions of transient effects of light on the local color of objects. Landscapes, still life, genre scenes, even portraits became mere vehicles for the artist’s analysis of capturing a moment in time in color and light. It revolutionized art in these ways: artists painted a complete work out of doors in order to capture light accurately; no underpainting was used, just the application of pure color; traditional earth tones such as browns, black, and yellow were avoided in favor of pure color combinations; many compositional traditions such as symmetry, closed composition, and narrative were out the window. By the 1880s, when most of the original Impressionists began to feel the style had become too restrictive, the style spread to the US and other countries. To the present day, Impressionism is a very popular style, as evidenced in the continued existence of such schools of painting as the California Plein Air Painters. Below are some Impressionists from the original period who, for some reason, usually fly under the radar in Western art history survey texts. Giovanni Boldini was born in Ferrara and left school early to pursue an interest in painting and drawing. He was academically trained in Italy, where he developed a fresh, naturalistic approach to landscape, more in keeping with Impressionist than Realist aesthetics. His style featured fluid, swishing brushwork, and adapted the habit of working on landscapes outdoors. In 1872 he moved to Paris, where he remained, more or less, the rest of his life. He became friends with Edgar Degas (1834–1917), a key Impressionist. Although he adapted the Impressionist palette and penchant for spontaneously capturing landscapes in certain light conditions, he habitually exhibited his portraits in the official Salon. His portraits, influenced greatly by his friend John Singer Sargent (1856–1925, US), became very fashionable among the wealthy in Paris. Like Sargent’s portraits, Boldini’s featured a lively, light-struck surface and flattering, idealized likeness. This view of Combes-la-Ville was near a rented house where Boldini stayed outside of Paris. In the 1870s, Boldini made the acquaintance of another Italian painter, Antonio Mancini (1852–1930), whose portraits and work also took on the Impressionist palette and an emphasis on flickering light through wispy brushwork. 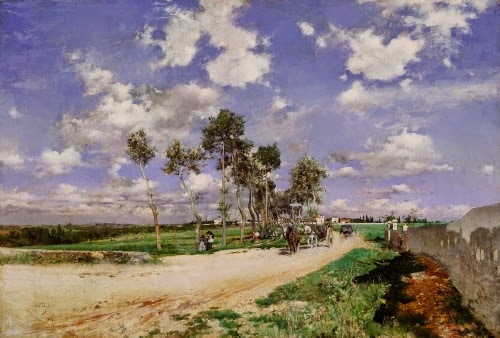 This sundrenched landscape has the freshness and spontaneity typical of Impressionism, and was most likely painted on the spot. A practically ignored, important figure in the American development of Impressionism, Dennis Miller Bunker, like many of the other American Impressionists, initially trained in the US in the academic style and palette. Early on he showed a penchant for landscapes, but in order to make money did many portraits. These works of his early mature period (1880–1882) reflect the tradition of preparatory sketches and later finished work in the studio in a somewhat somber palette. 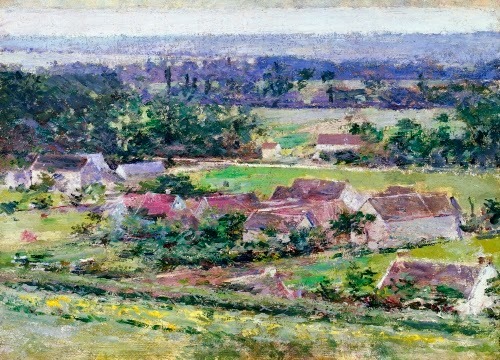 Bunker’s palette lightened somewhat on his visit to France from 1882–1883, where he began producing finished works outdoors in brighter colors, with emphasis on brilliant light. Although this did not result in an overly Impressionist style when he returned to the US, he taught and hung out with American Impressionists in New England such as William Merritt Chase (1849–1916), Thomas W. Dewing (1851–1938), and, most importantly, John Singer Sargent (1856–1925). His work acquired more atmospheric effects; subtle tonal changes; and a lighter, more saturated palette. 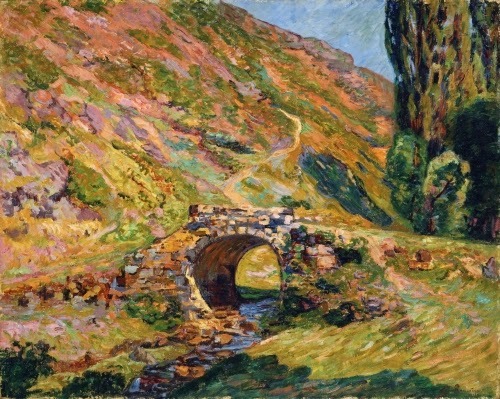 After painting with Sargent in England in 1888, Bunker’s style finally exploded into fully Impressionist. This work dates from the period when he was teaching in Boston, living in a boarding house in Medfield, MA. 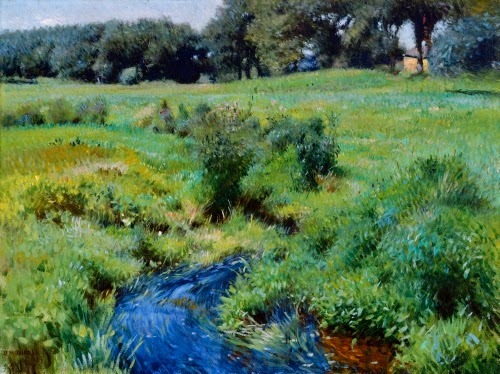 His earlier emphasis on darks and lights in a traditional palette now emphasize the effect of bright sunlight on the local colors of the meadow. 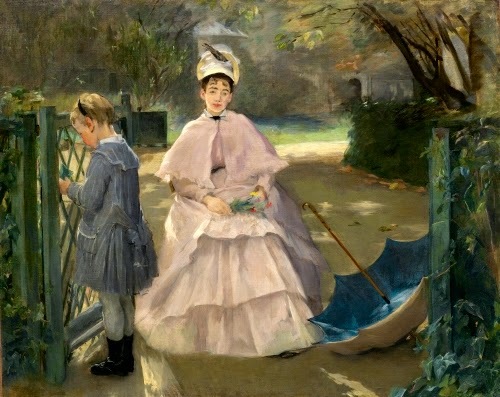 Besides Mary Cassatt (1844–1926) and Berthe Morisot (1841–1895), Eva Gonzalès was the only other woman artist active in the group of Impressionists in Paris. However, she doesn’t get the “book time” the other two women do, I’ve found. This is perhaps because she did not fully adapt all of the aspects of Impressionism, such as the use of pure colors, lack of underpainting, and flickering brushwork. Gonzalès trained academically before she met Édouard Manet (1832–1883) in 1869. Manet was a Realist who, in the 1870s, adapted the Impressionist palette and habit of painting outdoors. Gonzalès’ first exhibit came in 1870 at the age of 21, where she already showed the influence of Manet’s works of the early 1860s in the somber, muted palette; limited middle tone; silhouetting of the subject in strong back lighting; and fluid brush work. This palette, as it was with Manet, was the influence of Gonzalès’ interest in Spanish Baroque painting. Her work, however, was praised for its sensitivity, an acclaim never given to other Impressionists’ work. 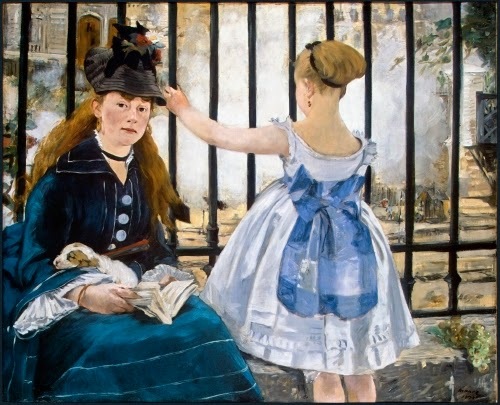 Works such as Nanny and Child are strongly reminiscent of Manet’s work, such as his 1873 The Railway, although by that time Manet had adapted Impressionist color, which Gonzalès never did. The capturing of a simple, intimate moment in carefully studied light and the casual composition set her work firmly within the sphere of Impressionism. Jean-Baptiste Guillaumin, who never achieved the “stature” of Impressionists such as Monet and Renoir, was nevertheless an active member of the group, and one of the key artists in spreading the style. He studied at the Academie Suisse in Paris in 1861, where he met Paul Cézanne (1839–1906) and Camille Pissarro (1830–1903), both artists who initially painted in the nascent Impressionist style in the 1870s. Cézanne’s later work was influenced by Guillaumin’s tendency to paint in broad, flat brush strokes. Guillaumin exhibited with the first Salon des Refusés (Salon of the Rejects) in 1863, an exhibition that set the precedent for the Impressionist salons starting in 1874, in which Guillaumin participated. He is most known for his scenes of Paris, but I like his rural landscapes. This one is gorgeous, and as you can see, he did not abandon the style through his later career. 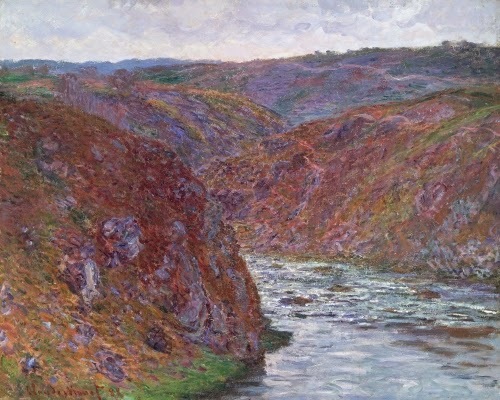 This painting reminds me of Monet’s series of the Valley of the Creuse. It is always tempting for me to show Japanese art from the late Impressionist period simply because it’s like a 360 degrees turnaround of artistic influence. Japanese art had quite an impact on the Impressionists in the reverence for nature and open, seemingly unplanned and often asymmetrical compositions. And, it was not because he had seen Swiss art that Monet built a grand Japanese garden complete with bridge and water lilies! Maruyama Banka initially trained in the literati style of traditional Japanese landscape painting that evolved from the ages old tradition of the Chinese scholar-artists. He eventually became Japan’s most celebrated watercolorist. However, in the 1880s, Maruyama began studying Western art, and subsequently visited Europe where he saw Impressionism, among other trends. He brought influences of the style back to Japan: the soft contours, atmospheric lighting, and solid emphasis on form rather than suggestion (such as mist) to define recession. 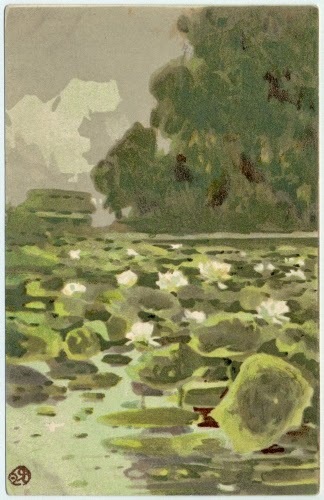 This post card is a lovely translation of Impressionism into lithography, an art form introduced in Japan during the last two decades of the 1800s. During the 1800s, Puerto Rican artists struggled with the aesthetic tradition of Spanish art and the increasing desire to cast off that mantle and establish an indigenous Puerto Rican painting school. Francisco Oller y Cestero was the first native Latin American artist to study in Europe. He studied in the 1850s in Spain, then in the 1860s in France, where he studied under the Barbizon Realists Thomas Couture (1815–1879) and Gustave Courbet (1819–1877). 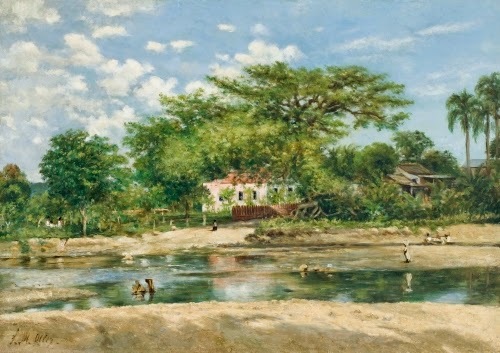 He also associated with future Impressionists Monet, Pissarro, Renoir, and Sisley, who helped him ultimately formulate an Impressionist style that he took back to Puerto Rico in 1865. His earliest landscapes of Puerto Rico were in the Barbizon Realist style. Another visit to Paris in 1873 cemented his interest in Impressionism. When he returned to his native Puerto Rico in 1884, he continued painting landscapes in the open air with the high-key Impressionist palette. This site gave Oller the opportunity to render reflections of light on water, a signature theme of Impressionism. He most likely painted this work while seated beneath overhanging foliage. Shadows cast from the leaves appear in the painting’s foreground, uniting the painter and viewer with the natural environment. Correlations to Davis programs: Explorations in Art Grade 1: 4.21, 4.connections; Explorations in Art Grade 2: 1.3, 1.5-6 studio; Explorations in Art Grade 3: 4.19; Explorations in Art Grade 4: 1.4, 1.5, 4.21, 4.22; Explorations in Art Grade 5: 4.19; Explorations in Art Grade 6: 2.7, 2.7-8 studio; A Personal Journey: 5.4; A Community Connection: 6.2; A Global Pursuit: 6.4; Experience Painting: 6; Exploring Painting: 7, 11; Exploring Visual Design: 5; Discovering Art History: 13.1; The Visual Experience: 9.3, 16. Impressionism cannot be adequately studied without looking at American artists who adapted the style. Because American art in the 1800s was firmly entrenched in realism, it must have been quite a stretch for American painters to introduce the Impressionist style in the US. Theodore Robinson is one of the leaders in introducing Impressionism into American art. Robinson, although trained academically in the US, went to Paris first in 1877–1879 during the heyday of Impressionism, and then again in 1884. It was during his second visit that he Impressionism transformed his style. He was greatly influenced by Monet, with whom he had become friends and neighbors in Giverny, where he stayed from 1888–1892. When Robinson returned to the US, he obtained teaching positions and worked with groups of other American painters interested in Impressionism, particularly John H. Twachtman (1853–1902) and Julian A. Weir (1852–1919) in the Cos Cob art colony in Connecticut. The paintings he produced of the American landscape show how successfully Robinson merged his Impressionist style with a fervent love for American views. We probably do not usually think of sculpture when talking about Impressionism. 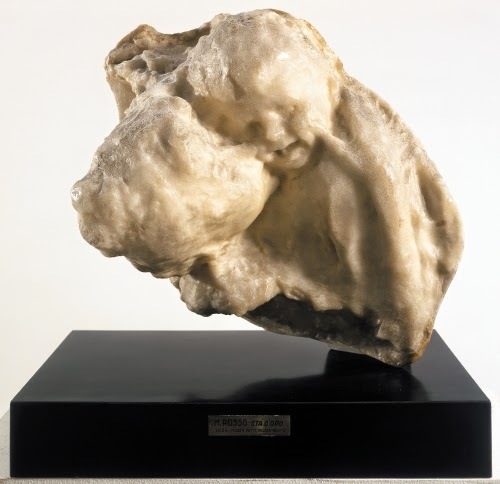 Medardo Rosso’s work, although he was a sculptor, definitely expresses some of the aims of Impressionism, even though the movement was obsessed with the effect of light on color. Rosso’s work explored the effects of light on sculpture and how it could infuse a sculpture with movement. Rosso was trained as a painter in Milan. After being dismissed from the Brera Academy there in 1883, he moved to Paris where he studied with the great transformer of French sculpture, Auguste Rodin (1840–1917). Rodin’s sculpture bucked the prevailing academic stodginess of French sculpture that was stuck in the classical/historical/heroic mode. His works broke new ground in compositions without limbs (influenced by ancient sculpture), and works with roughly textured surfaces that seemed to come alive in light. Rosso seemed most influenced by the rough surfaces of Rodin’s work. Like Rosso’s work, Rodin’s work, too, has sometimes been associated with Impressionism. Rosso’s favorite medium was wax, because of the ability to create the subtlest nuances in transition between figures, and between figures and background. Because of the medium, his works are very intimate, a fact that had impact on modernist sculpture in the 1900s. This work of a mother and child recalls the intimate, unmannered subjects of Impressionists such as Cassatt and Morisot. Like the Impressionists, obviously, Rosso was a master at capturing a fleeting moment with a striking immediacy.